In this third of six parts to be published over the next couple of weeks, we talk about life at the County Ground under Glenn Hoddle, a return to Old Trafford and a flirt with the Premier League. Glenn came in towards the end of 1990/91, a similar class of player to Ossie, what did you make of Hoddle? Interesting character is Glenn. We were obviously his first club. Glenn is very back and white, with a great foil in John Gorman, who was one of the nicest men you could ever work with in football. So John did well for Glenn. I don’t really remember too much about the end of that season, when we just managed to scrape through and avoid relegation. The start of the next season I fell out with out with Glenn and he dropped me for the first time in my career. It was an interesting time. Yes Nicky did [got a run of games] under Glenn. I started it off and for some reason he just wanted to play us off against each other. I think he’s done that a lot with players in the past. Is that the way Glenn believes he can get the best out of players? I don’t know, I didn’t like Glenn at the time, although I get on well with him now. I felt a bit hard done to, I felt a bit of a scapegoat. Did you fall out with Hoddle then at the time? It’s purely and simple that it was Glenn’s team and he wanted to do it [his way]. I made a few mistakes and didn’t play with confidence, but he decided that he wanted to freshen it up and change it so he dropped me for the first team – I think after the Oxford game – when he blamed me for one of the goals. He dropped me for the next game. Perhaps after years of being the no.1 you were resting on your laurels at the time..? I may have lost a bit of confidence, but I probably put myself under undue pressure, which is not good. I was still only in my early twenties anyway, then I probably needed Glenn to pull me in and put his arm around me and say what can we do to help, but he didn’t do that. That just wasn’t his style. So for whatever reason to go up to United was fantastic because then coming back to Swindon I was flying. Ah yes, the return to United! This was the time when we didn’t have goalkeepers on the bench so I had gone from – basically within a week – a phone call from Alex Fergusson to say that he had a goalkeeping crisis, “will you come back to United?”. So I said, I’ll start walking now! That for me was an unbelievable week. You go from rock bottom, to being dropped, to then having the opportunity to go up to United and work with the players up there. Going back to United must have been immense. What did you take from your return to Old Trafford? Working with Peter Schmeichel was probably the best two months I’ve had in my whole career. This helped me out in a phenomenal way. You go back to the players at United at the time, you had Peter, Dennis Irwin, Arthur Albaston, Gary Pallister, Steve Bruce, Bryan Robson, Paul Ince, Lee Sharpe, Ryan Giggs, Mark Hughes; some great names. To train with them every day was fantastic. The training seasons, I thought we were decent at Swindon, but then you go up to Old Trafford and you do the training and it’s just the balls and going bang bang bang bang bang, the balls in the back of the net. So for me to compete with that I had to raise my game considerably. It took me a few days to get used to the pace, but then working with ‘Big Peter’ seeing the way he did things, for me was brilliant. By the end of those two months during which I played reserve games for them and Fergie praised what I did, he was really happy, all that must have got back to Glenn as he called me back. I didn’t want to come back, I wanted another month at United! But he called me back and the rest they say is history because I played in every single game, which then culminated in the 4-3 at Wembley. What a great day that was! What are your memories of that bank holiday Monday at Wembley Stadium against Leicester City? It’s not [a game] that I’d want to repeat! To go 3 nil up then be level! So you were 3 nil up and 1 goes in, what do you think? We’re still in control of the game. And then you start worrying. Let’s hold out, let’s see if we can get another and a two goal cushion. Then they can back to three all and I thought we’d lost it, we’d cocked it up. Fortunately then their goalie does his best and Chalky won us a penalty. He [Steve White] still swears to this day it was a penalty! We took the opportunity presented to us and we got promoted. My only thing after that was too many people made it about Glenn. The rumours were that Glenn was going to go back to Chelsea. That deal had already been done pre Glenn joining the club. Because it was always an understanding that as soon as Ken Bates goes like that [clicked his fingers] Glenn would go back to Chelsea. Glenn had trained with Chelsea before joining Swindon and Ken did a deal with the club for Glenn to become manager, but there was a proviso with it – and I don’t know the full mechanics of it – that Glenn would return as manager of Chelsea. It was all in the offing for a couple of years, but I can’t say for definite what the mechanics were. He’s a shrewd man is Ken, he’s done well at whatever clubs he’s been at. Was it common knowledge amongst the players that Glenn would be off post Wembley? No, we didn’t know anything then. The celebrations soon took on an open PR exercise to keep Glenn..
To be fair yes. He was our skipper. So that took the heart out of the club with both Glenn and Colin both going. We lost two main figures. It soured the celebrations because the overriding memory people will have is of that [‘Don’t Go Glenn’]. 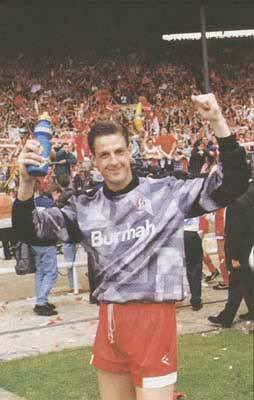 Not entirely that we had just got promotion to the Premiership, everyone putting the attention on Glenn took the shine of the achievement. I think it’s been good this year. After the bad start and the way things went, for him to turn it around with the good squad of players that he has there now, and I hope West Ham being promoted will allow Di Canio to stay at Town for at least another year. He needs a good couple of years. I started the season until I got injured at Sheffield Wednesday when I dislocated my shoulder and that took me out for two months. And then I never really got back fit, to get back into the team. Have you spoken to Gordon Watson since..? No, it was just one of those freak accidents, the ball has come over, he’s come to head it and as I’ve gone to punch it he’s obviously hit me in the wrong spot. As soon as I put my arm down I knew it had gone and popped out. I couldn’t get up and the blimming referee played on, they took the one-two and scored. I don’t think that went down too well with the lads anyway. It’s one of those things. I’d liked to have played a few more of the games, but I played some of the big games, such as at Old Trafford, we lost 4-2. That was the bit for me, going back to Old Trafford. As I’d been there the year before on loan, so it’s nice to be able to go back and pit my wits against them again. We got done [that day] by Eric and Andre Kanchelskis. They were phenomenal. Yea that’s what I tell people. And a big thing for me – and I tell him this – is that Andy Cole never scored against us. That was the year he scored about 43 goals for Newcastle and Swindon are the only team in the Premiership that Andy played against and he never scored. What it was, John Beresford and Rob Lee – who I know really well – Coley was hitting them, I was saving them, but then Rob was following them in. We lost 7-1 that day, it could’ve been 20! What do you put Town’s failure that season down to? We didn’t have a solid team. The problem was you make a mistake in the Championship and you can get away with it. Every time we made a mistake, however small, we got hammered in the Premiership. It was a nightmare. We’re not the worst are we..? As far as the Premier League goes, 100 conceded is the record, but points wise Swindon’s tally is far from the fewest points, Sunderland and Derby had awful seasons. Yes, but we weren’t clever enough. John Gorman – bless his soul – didn’t have a tight enough back four, a tight enough team where we all worked together. Like the one we had before with David Kerslake at right back, Paul Bodin at left back, Shaun [Taylor] and Colin [Calderwood] in the centre, that was a great back four, with Glenn sitting in the sweeper, [then] we didn’t concede many goals. Unfortunately it changed a little bit in the Premiership, we didn’t have a regular and solid team. Ross McClaren had started off at the back [in sweeper following Glenn’s departure] he was injured and shouldn’t have even been in there, but he did, and he went missing when we started letting a few goals in and was not focused. Killer [Kilkline] god bless his soul, he was probably a bit past it, even then when he came in. John had brought him in for experience but he didn’t really do what we needed him to do. And that was the problem, we didn’t have the quality we had before. If Colin hadn’t gone, that totally changed the dynamics. Colin going was a decent amount of money for the club but we needed him in the club, we didn’t need to get rid of him. But my wife went round to see his wife and his daughters. She read my wife the suicide note and there was just nothing in it. There was no real why. I mean why does anybody do something like that –so I don’t know, it was a strange one. Kevin was a larger than life character. I mean he played the spoons everywhere; he was just a larger than life character. It was just a sad state of affairs. He would get a job in a football club these days [as a physio] because he wouldn’t be at the standards but in them days… He was a great bloke, I mean he had his little idiosyncrasies – he used to smoke his pipe all the time which used to get on the lad’s nerves but it was part of his character and we all got on with him.